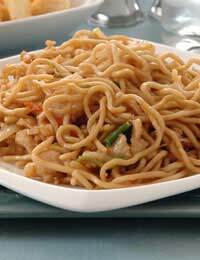 Archaeologists in Northwest China have unearthed a bowl of noodles approximately 4000 years old. The noodles, made from millet, are long, thin and beautifully preserved, and they make Italy’s claim to be the true home of the noodle look rather sorry for itself! By 100 AD Chinese rulers were already enjoying wheat noodles, and their ease of preparation, shelf life and nutritional value soon made them popular throughout the land. In the north of the country where conditions favour the cultivation of wheat this style still prevails while in the south, more rice noodles are eaten. Noodles symbolise longevity, which is why they should never be cut! In some places noodles are even served in place of a birthday cake. Don’t be deterred by this long list of ingredients: this is a very easy recipe! Cook the noodles according to the instructions on the packet. As soon as they are ready, drain and rinse in cold water. Drain again. Toss in sesame oil. Place the dressing ingredients in a blender and whiz until smooth. It should be the consistency of single cream so add hot water and blend again if necessary. When you’re ready to serve, toss the noodles in the sauce and make sure they’re well-coated. Garnish with strips of cucumber, chopped roasted peanuts and finely chopped spring onions. Serve at room temperature. Cook the noodles according to the instructions on the packet. Drain. Mix together the soy sauce, oyster sauce, sesame oil and water. Add the tofu cubes to the mixture. Heat some oil in a wok and stir fry the carrot and broccoli for 2 minutes. Using a slotted spoon lift the tofu from the sauce mixture and add to the wok. Stir fry for 4 minutes. Add the garlic and ginger and stir fry for another minute. Stir in the noodles, the sauce and the cashews. Continue stirring until heated through. Serve immediately. Mix together the marinade ingredients and place the chicken strips in it. Leave to marinate for 1 hour. Mix together all the sauce ingredients.Cook the noodles as directed on the packet. Drain. Heat 1 tablespoon oil in the wok. Add the garlic and chicken and stir fry until the chicken is nearly cooked. Push the chicken up to the sides of the wok and throw the raw prawns into the centre. Stir fry until cooked. Take the chicken and prawns out of the wok and set aside. Add 1 tablespoon oil. Stir fry the pak choi, broccoli, carrot and onion until just cooked. Sprinkle salt over the vegetables, stir and then take out of the wok and set aside. Add 3 tablespoons oil to the wok. Stir in the noodles. Add 2 tablespoons chilli sauce and 1 tablespoon light soy sauce. Stir fry until heated through. Return the chicken, prawns and vegetables to the wok. Stir the sauce mix and add to the wok. Heat, stirring, until the sauce thickens and everything is hot. If using cooked prawns, don’t do the initial cooking; add near the end with the cooked chicken and vegetables.